In the sixties the music market was at its peak in Italy and the country was among the firsts in Europe for buying discs and for production of new songs. A strong demand that has generated the phenomenon of the "covers", English and US songs translated in Italian (or even with completely new lyrics). Thousand of songs were proposed in Italy in this way, including the main successes of the decade. On the other direction, the great interest for the Italian music market, the interdependence between the markets and the uniformity of musical styles, led many foreigners performers to select Italian songs and to prepare an English version starting from it. Just as happened in Italy, the new English text was very often unrelated to the original Italian one, as one can understand from the title of the original song; the main interest was related to the melody and to the song structure. Also note that even in this small sector Mogol and Battisti (the most important authors in Italy during the sixties and the seventies) have left their mark, some of the most successful songs abroad bring their signature. These "covers on the contrary", where the original was Italian, were few, compared to the total of those sung in Italian. The main ones are listed on this page, excluding the "self-covers" for the foreign markets published by several Italian singers. Wilma de Angelis / Jula de Palma. The original song was presented at the Festival of Sanremo in 1959, the most important Italian event in music since 1950, by two well-known interpreters of Italian song, between jazz and pop song, Jula De Palma and Wilma De Angelis. Brenda Lee was a US singer who had started to publish records in 1957 when she was 13 years old. The original Italian song was written by the great Genoese singer-songwriter Umberto Bindi. Great success in the UK (# 1 in 1964 and top-20 in the USA in the same year). Cilla Black (real name Priscilla White, a curious choice for a stage name, black is better than white, we guess). [Prisoner Of The World] Lucio Battisti Produced by George Martin, conducting and arranging of Mike Vickers, the English text by the same Cilla Black, this is the English version of a song interpreted by Lucio Battisti and penned by Mogol (lyrics) and Donida (music). A good performance by Cilla Black of this song very popular in Italy. All My Love (1967) Cliff Richard Solo tu (1967) Orietta Berti 45 rpm single published by EMI Columbia, cat. DB 8293. Lyrics in English by Peter Callander, good success in UK: #6 in 1967. The original is a song proposed by the popular Italian singer Orietta Berti in a music competition called "Un Disco per l'estate" (a record for the summer) in 1967. Author of the original one was the musician Federico Monti Arduini, most known in the following years as "Il guardiano del faro (the lighthouse keeper). Original disc Polydor NH 59802, pubblished in april 1967. [I don't Live] Pino Donaggio The rousing song penned and performed by Pino Donaggio had been a success in Italy in 1965, reaching the top of the bestseller list, and the following year in the English version of Springfield has reached # 1 in the UK and # 4 in USA. Subsequent interpretation and good success also by Elvis Presley (1970, # 11 U.S.). It's Now Or Never (1960) Elvis Presley O sole mio (1898) Many performers One of the most famous Neapolitan songs, O sole mio (Oh my sun) was proposed in an English version with different lyrics (by Aaron Schroeder and Wally Gold) firstly by Dean Martin and afterwards by Elvis Presley. The version of Elvis was a great success with more than 25 million records sold worldwide. Instead of speaking of a sunny day after a thunderstorm, the new English verses are about a sort of ultimatum. Surrender (1961) Elvis Presely Torna a Surriento (1905) Many performers After the great success of It's Now And Never Elvis and his label planned a second similar operation the following year. Another classic of the Neapolitan music, Torna a Surriento (Come back to Sorrento) with an adaption of the well known couple of authors Doc Pomus and Mort Shuman. Also this time, only the music is taken by the original song of the brothers Ernesto and Giambattista De Curtis. There was anyway a previous version with more related lyrics, title Come back to Sorrento, performed by Claude Aveling. Ask Me (1964) Elvis Presley Io (1958) Domenico MOdugno Another romantic performance of Elvis coming back after his military duty in the US Army. The original was a song written and composed by the Italian songwriter Domenico Modugno, well known worldwide after the worldwide success of "Volare" (Nel blu dipinto di blu, In the blue painted of blue, the original title). This song was written by Modugno, with lyrics of Franco Migliacci, in the same year of Volare. Original disc Fonit SP 30399. The original Italian song was written by Livraghi, Panzeri and Pace, and it was presented during the Sanremo Festival of 1968 with great success by the rookie singer Anna Identici, paired with the American vocal group The Sandpipers. 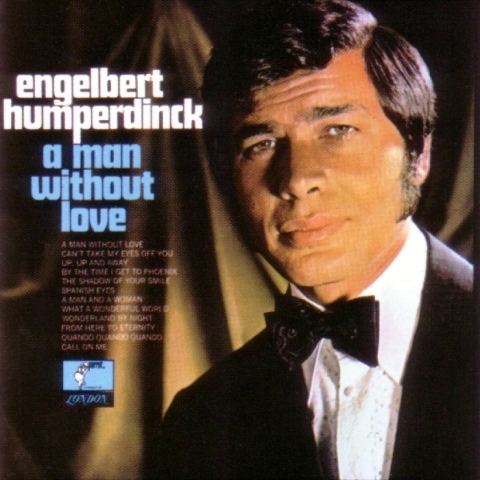 The version of the British pop singer (real name Arnold George Dorsey, Humperdinck was an Austrian composer of '800) with totally unrelated lyrics, seems to have arrived in the top 20 worldwide in 1968 (# 19). Mina This song was played by Mina, the most famous Italian singer of the sixties, in a particular, melodramatic way (holding back tears). It was included in the album "2 Note", and penned by maestro Tony De Vita (arranger and former collaborator of Mina until 1963), with lyrics by Giorgio Calabrese. Hal Shaper added English lyrics and the song has become a classic in the interpretation of Frank Sinatra. Two years before, the British singer Matt Munro had also a good success in UK with his version of this song. This famous song was translated in English and published in UK by The Rokes (English but singing in Italian, the most successful beat group in Italy during the sixties, together with Equipe 84, an Italian band) before the launch in the U.S. market by The Grass Roots. The song was originally the B side of the Italian success of Rokes Che colpa abbiamo noi ("What fault have we?") which in turn was a translation of Cheryls' Going Home, the "B" side of the success of Bob Lind "Elusive Butterfly Of The Love". The music of Piangi con me was written by Shel Shapiro, the leader of Rokes, the original words by Mogol, the most important lyrics' writer in Italy in that period, but the lyrics in English, completely different, were written again by Shapiro. You can read the whole story of the missing success of The Rokes here. The Grass Roots proposed also an English version of the first success of Lucio Battisti, the most important author and performer in the Italian pop music during the sixties and the early seventies. The American version went to No. 25 ranking in the USA. Lucio Battisti in the USA is remembered, to judge from what is listed on All Music and other websites, more as the author of this song than for his efforts in the English language. English lyrics totally unrelated to the Italian ones. The original is a a big success presented in 1964 by John Foster at the Disco per l'estate (A disc for the summer: a contest for the best pop song of the summer). The song had been composed by Pallavicini and Mescoli and soon became a classic romantic song known all around the world. John Foster was the pseudonym used for the singing career by Paolo Occhipinti, a very well known journalist, 25 years later director of the popular weekly magazine "Oggi". [July] Riccardo Del Turco From the song penned by Giancarlo Bigazzi and Riccardo Del Turco, great success in Italy in the same year 1968, a very faithful version (except in the lyrics) and quite buzzy by the band from Manchester, now definitely entered in the vast territories of pop music. [The Hills Are Blooming] Wilma Goich Ken Dodd was an English comedy actor rather popular in the 60s. The original was the romantic song proposed by Wilma Goich at the Sanremo Festival in 1965, in tandem with the New Christy Minstrels, that kicked off her career. The original song was penned by Donida and Angiolini with lyrics by Mogol and Calibi. The English lyrics were written by Shuman. [You Return In Mind] Lucio Battisti The Love Affair group with a cover of a successful Italian song by Mogol and Battisti (the most successful couple of Italian authors). A weak version almost mainstream style (great use of strings and choirs), which, however, uses only the refrain of the original. Poor commercial success, although it was in regular programming on Radio Luxembourg. [I would, I wouldn't, but if you want to] Lucio Battisti In his first solo album (Slaughter on 10th Avenue) the David Bowie band's guitarist had included this cover of a very famous Italian song by Mogol and Battisti, with a fine rock arrangement. Mick Ronson was very fond of Lucio Battisti. The English lyrics was written by David Bowie and just did not take into account the original by Mogol. For the B side of her single in 1965 Let the People Talk Neil Sedaka, who had already published several discs in Italy, recorded a convincing cover by the great romantic success of Gianni Morandi, the most popular singer of the Italian pop music during the early sixties, a song written by Migliacci (text) and Zambrini (music). Since the protagonist of the Italian song was already on his knees, the American lyricists transferred him straight into a church. Neil Sedaka has published in a first time the Italian song, written by Migliacci and L.E. Bacalov (he was very well known known in Italy at that time, with many songs in the charts sung in Italian). Afterwards the song was translated in English and published by the US singer and songwriter as B side of the US single The Dreamer. 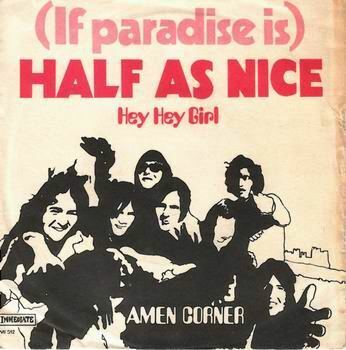 First version by Ambra Borelli, launched by Ricordi, the n.1 Italian record lable at that time, as "La ragazza 77" (The girl 77), then the song was published by Patty Pravo, one of the most popular singer in Italy in the sixties and seventies, with a simplified title "The paradise". It is, again, a song written by Mogol and Battisti. The later English version has had a great success, reaching No.1 in the UK in early 1969. The original was presented by Sergio Endrigo, one of the most famous and popular Italian songwriters, at the Sanremo Festival in 1969 (YouTube video recommended). Published by Petula Clark in 1969 in the album Portrait Of Petula, which also contained his success Happy Heart. The original was a song presented at the Sanremo Festival in 1968 by Dino and Wilma Goich, two popular singers in Italy during the sixties. In the Festival each song must be presented by a couple of musicians or groups. 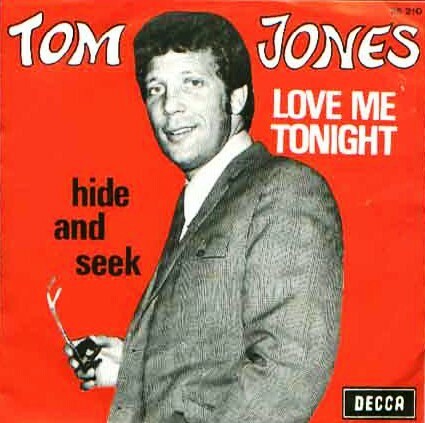 The English version by Tom Jones has became, as everybody knows, one of the biggest and enduring successes of the powerful Wales singer. A song exchanged between Italy and UK a couple of times. The original one, written by Pace, Panzieri and Pilat, was presented at the Sanremo festival in 1969 by an English group active since mid sixties in Italy, The Casuals (known outside Italy mainly for Jesamine) in couple with Junior Magli (a young singer from Bologna, a brief career for him). The version performed by Tom Jones was another great success, both in UK than internationally. The Tremeloes (Brian Poole & The Tremeloes, at the beginning, but this song was recorded after the release from the group by the leader Brian Poole) are a British band often mentioned for being preferred, in 1962, to the Beatles by an unwary Decca manager. They are engaged in this case, a few years later, in a cover song from an original of the famous Italian pop singer Orietta Berti, an extreme easy listening piece, n.2 in the summer contest "Un disco per l'estate" in 1968. The song was nevertheless very much appreciated in the United Kingdom and came to the 6 th place ranking in the year of publication. A version in English for the evergreen written and presented by Adriano Celentano at the Sanremo Festival in 1966. A song that has a good reputation and memory in the UK and that has arrived in this version to No. 1 in Australia, as it seems. Somewhere is cited as an English version of "La maison ou j'ai grandi" by Françoise Hardy, that is the French cover song of the same Italian original. But it comes instead from the original of Celentano, Beretta and Del Prete, because most faithful (starting from the title) to its ecological inspiration, even if they are omitted, also in this case, the final explicit declarations.